I'm so excited to do this tag! I was tagged by the lovely Tania Michele! I love her blog so much! She is such a sweetheart! She blogs about lifestyle and geekiness! I love it so much! Check out her answers to the tag here. I love so many! My favorite thing about the Christmas season is having Christmas movie marathon! Think my all time fave is Christmas Vacation or Polar Express! I have so many favorites! It's so hard to choose! You can read all of my favorites and recommendations in this post. 2.) What holiday traditions are you looking forward? I have a couple traditions that I really enjoy! I love looking for a new yearly ornament every year! I also love Christmas movie marathons with my dad! 3.) Ever had a white Christmas? When I was a kid we always had snow in December. So snow was always on the ground on Christmas but I've never seen snow fall on Christmas. We haven't even had snow on the ground during Christmas for the last 8 years or so. I miss it so much! I thought we would have it this year but it melted. But the forecast is calling for morning snow showers on Christmas day and I am crossing everything that it happens! 4.) Where do you usually spend your holidays? My mom and I go to my sister's to have a Christmas with her and her kids. Then I go to my dad's for Christmas Day. I might convince my mom to pop over and eat some ham and open her gifts from me. Christmas is a lot different since my parents split but I try to make the most of it. So many again! I love Christmas music! My Playlist is forever growing! Merry Xmas Everybody by Slade is defiantly up there! 6.) Pro-wrapper or serious fail? A mix. If it's a box with complete sides I rock it! But anything weirdly shaped or with an open front is much more complicated. I ace the boxes but I fail at just about anything else. I love favorites Hot Cocoa! Cinnamon, Gingerbread, Snickerdoodle! I love them! I also love Apple pie and turnovers and such. I have to make all of those my own now. Needing to be gluten-free is the worse! I can't wait to attempt some GF treats this year! 8.) Do you make New Year's resolutions? I don't really make resolutions. I make goals but I don't see them as the same thing. Resolutions are things you want to change. I focus on what I want to make happen. 9.) What makes the holidays special to you? Family! Growing up I remember decorating with family and making Christmas dinner together. My dad always makes sure to see me for Christmas! Those will always be memories I cherish! 10.) Real or fake tree? We always had a fake one growing up. I still have a fake one but I'd love to have a real one someday! 11.) Do you open presents on Christmas Eve? When I was a kid we opened one gift or sometimes our stocking. Then the rest on Christmas morning. For the past 4 or 5 years, my dad and I have started opening gifts on Christmas Eve so Christmas day is a relaxing day of Christmas movies and lots of food. 12.) Can you name all of Santa's Reindeer? Yes! It amazes me that some people can't. I grew up with the version of Ruloph the Red-Nosed Reindeer where it lists out all the reindeer at the beginning. We sang it in my kindergarten Christmas music class show. It was one of my favorites growing up! Dasher and Dancer, Prancer and Vixen, Comet and Cupid, Donner and Blixen. And the most famous of them all, Rudolph! 13.) Giving or receiving gifts? Giving. I love seeing the look on niece and nephew faces' when they are opening their gifts! I love picking things out for them! 14.) The best gift you've ever got? There have been many over the years that I consider the best gifts I've ever received, all special in their own ways. The ones I consider the most special are my dad being with me every Christmas and my camera. 15.) Dream place to spend the holidays? I love being at home! But if I ever were to go away for Christmas I'd want somewhere in the mountains, in a nice cabin with modern amenities and Christmas decor to the max! And snow everywhere! I'd love to go with my parents and my sister and her kids and husband. Maybe I can do it one day. Hopefully with a SO and kids of my own! I remember my Aunt had this bell decoration that played "We Wish You A Merry Christmas" with bells and I remember loving it to bits. I remember the year my parents split my dad made sure to come see me. He couldn't stay long but he made sure to see me. I remember always being the first one up and waking up everyone. I remember that my dad used to record all of Christmas morning on his huge VCR camera. It was huge! It recorded on VCR tapes. I still have all of them in a box somewhere. 17.) What made you realize the truth about Santa? Looking back I'm kind of happy I got to keep the wonder for a few extra years. It added a bit more Christmas cheer! That was such a fun tag! Thanks again to Tania for the tag! Make sure to check her out! Where is your dream place to spend the holidays?
. 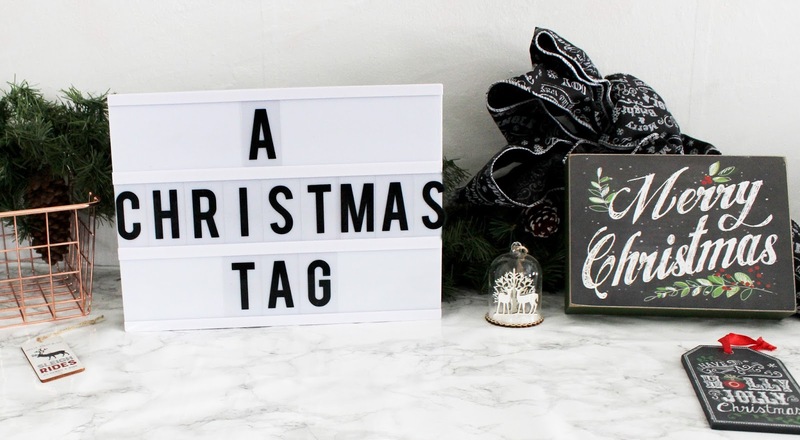 Blogmas, Blogmas 2017, Christmas 2017, Christmas Tags!, Christmas!